SAN JOSE, Calif.--(BUSINESS WIRE)--Cypress Semiconductor Corp. (NASDAQ: CY) today announced a new series in its Traveo™ automotive microcontroller (MCU) family with more memory to support a hybrid instrument cluster with 3D graphics and up to 6 traditional gauges, as well as a head-up display. The highly integrated, single-chip devices in the S6J32xEK series include an advanced 3D and 2.5D graphics engine and provide scalability with Cypress’ low-pin-count HyperBus™ memory interface. The series continues Cypress’ expansion of its broad automotive portfolio with differentiated system performance via its MCUs, wireless radios, capacitive-touch solutions, memories and Power Management ICs (PMICs). More information on the Traveo MCU family is available at http://www.cypress.com/traveo. The Traveo S6J32xEK series integrates up to 4MB of high-density embedded flash, 512 KB RAM and 2MB of Video RAM, an Arm® Cortex®-R5 core at 240-MHz performance, a Low-Voltage Differential Signaling (LVDS) video output, a Low-Voltage Transistor-Transistor Logic (LVTTL) video output and a 6x stepper motor control. This combination enables the devices to serve as single-chip solutions to drive two displays. The devices have up to two 12-pin HyperBus memory interfaces that dramatically improve read and write performance of graphical data and other data or code. A single HyperBus interface can be used to connect to two memories for Firmware Over-The-Air (FOTA) updates, which enable end-users to get software fixes and new features and applications for their vehicles on-the-go. The devices support all in-vehicle networking standards required for instrument clusters, including Controller Area Network-Flexible Data (CAN-FD) and Ethernet AVB. Additionally, the series provides robust security with integrated enhanced secure hardware extension (eSHE) support. 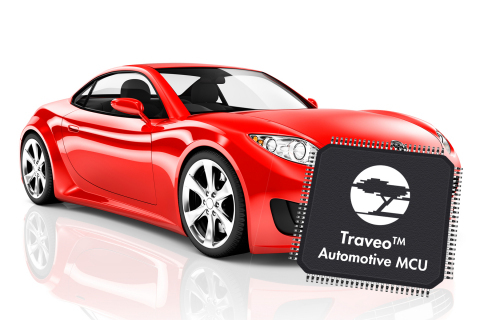 The Traveo S6J32xEK series include 50 channels of 12-bit Analog to Digital Converters (ADC), 12 channels of multi-function serial interfaces and I2S interfaces with an AUDIO DAC to output the complex, high-quality sounds required in today’s instrument clusters. The devices’ support for Ethernet AVB delivers increased bandwidth in multimedia applications and reduced programming time. The S6J32xEK series offers functional safety features to support Automotive Safety Integrity Level (ASIL) B, and the devices feature a wide ambient temperature range of -40˚C to +105˚C. The Traveo family is backed by a comprehensive tools and software ecosystem that simplifies system integration, including AUTOSAR MCAL 4.0.3 support. The Traveo S6J32xEK series is sampling now and will be in production in the first quarter of 2018. The MCUs are available in a 208-pin and 216-pin thermally enhanced quad flat package (TEQFP). Cypress works with the world's top automotive companies to bring leading-edge automotive systems typical of luxury models to mainstream vehicles, including Advanced Driver Assistance Systems (ADAS), 3-D graphics displays, wireless connectivity, full-featured touchscreens and superior body electronics. Cypress’ automotive portfolio includes the Traveo MCU family, power-management ICs (PMICs), PSoC® programmable system-on-chip solutions, CapSense® capacitive-sensing solutions, TrueTouch® touchscreens, NOR flash, F-RAM™ and SRAM memories, and USB, Wi-Fi® and Bluetooth® connectivity solutions. The portfolio is backed by Cypress' commitment to zero defects, excellent service and adherence to the most stringent industry standards, such as the ISO/TS 16949 quality management system, the Automotive Electronics Council (AEC) guidelines for ICs and the Production Part Approval Process (PPAP). Learn more at www.cypress.com/automotive. Cypress, the Cypress logo, PSoC and CapSense are registered trademarks and Traveo, HyperBus and F-RAM are trademarks of Cypress Semiconductor Corp. All other trademarks are property of their owners. 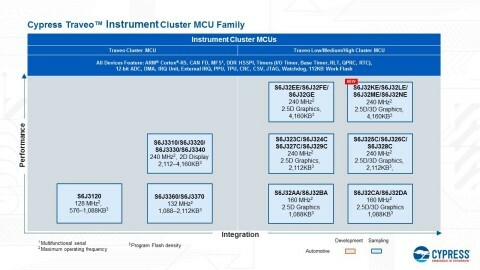 Cypress Semiconductor announced a new series in its Traveo automotive MCU family with more memory to support 3D graphics in instrument clusters.